The #1 enemy of any water ionizer is scale buildup inside the plate cell. More specifically, scale buildup on the membranes that are between the plates. When this occurs your ionizer cannot separate acidic and alkaline minerals properly and ORP and pH are reduced. Regardless of how well the self clean function on your ionizer works, scale or mineral build up will eventually overtake your plate cell, even if you have soft water! Remember that your ionizer concentrates minerals in the plate cell, which is part of how higher pH levels are created. 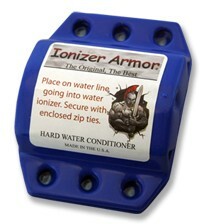 Ionizer Armor® easily snaps on your cold water line under the sink. As the cold water passes through the directional magnetic field of the Armor, the water goes through some very advantageous changes. The ability of scaling minerals to stick anywhere is dramatically reduced. Our in-house testing has shown a 40-60% reduction in scale buildup, not only in the plate cell but inside the entire machine. Scaling minerals are abrasive- this abrasiveness is extremely hard on the Platinum coating on your plates, this is why ionizer plates last a lot longer in “soft water” conditions. After passing through the Ionizer Armor®’s field, these minerals become far less abrasive protecting the plate coating in the process! Lower surface tension! Yes the Ionizer Armor® can achieve minor Micro-clustering of the water even before it enters the ionizer! This gives you even more absorbable water than with an ionizer alone. Silky smooth texture of the water. Water that has been through the Ionizer Armor®’s field has a noticeably silkier feel in the mouth. Try this experiment: Before installing the Ionizer Armor®, pour a large glass of ionized water. Then install the Ionizer Armor®, run machine for approx 20 seconds and then fill another large glass. Taste both waters and you will “feel” the difference in your mouth! As water molecules pass by the powerful, highly focused magnetic field, two things happen: molecules are polarized (organized) and the water takes on a net positive (+) charge. This physically changes the water’s molecular structure. The result is soft water characteristics with dissolved minerals, which will protect your water ionizer investment. Beware of imitators and knock offs! We are the first and the original–no one else even compares. We tested various strengths (Gauss) and directional magnetic field products for over three years before choosing the current Ionizer Armor®’s strength level and field direction. Some of the strengths and direction combinations we tested actually caused more scale to buildup inside the machine, some created no results at all. When choosing this type of product don’t settle for scam artist versions or cheap knock offs, insist on the first, the original and the highly field tested IONIZER ARMOR®. Ionizer Armor® is built to last. Should the front and back sections ever fail to snap together, mail the unit back to the dealer and it will be replaced free of charge. Ionizer Armor® is made in the USA. Warning: Ionizer Armor® is not a simple magnet, it is an engineered, studied and field tested product that uses a precise and directional field to achieve its superior results. Taping a magnet on the water line will not come close to producing the same results and could cause damage to you or your machine, trust us, we’ve tried it.